Our Multi-Injection System for Golf sport is used successfully for many years. 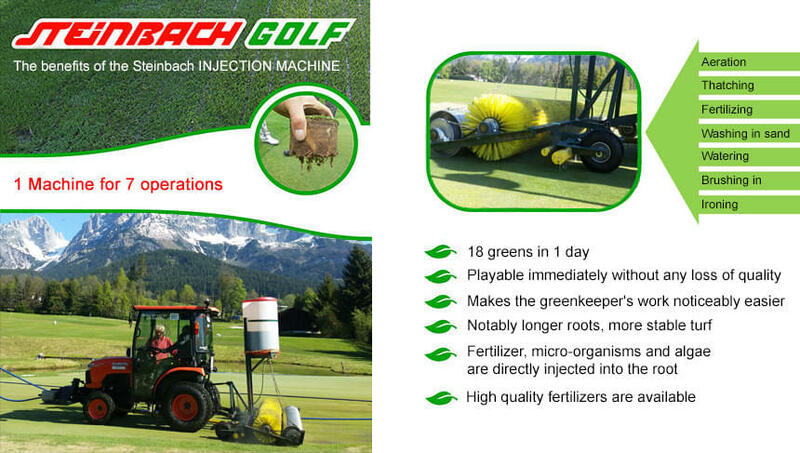 Christian Steinbach, the innovative inventor from Kitzbühel, fulfilled a long-time dream with Steinbach Golf. As an avid golfer, he was looking for a system with which to maintain, aerate and improve greens without interrupting gameplay. He succeeded in this with the Multi-Injection-Machine. This allows aeration, thatching, washing in sand, brushing in, ironing and watering in one single work step, and most important of all, the fertilizer is channelled directly to the grassroots. That's exactly where the plant needs it and can best absorb it. The result can be seen after just a few weeks, in form of notably elongated root growth and healthier greens. But best of all, even discerning golfers can enjoy golfing without any limitations the very next day.